Southampton manager Ronald Koeman has warned his players they will be dropped if they try to force a transfer. Forward Sadio Mane, 23, and midfielder Victor Wanyama, 24, have been linked with moves to other clubs. Mane was dropped to the substitutes' bench for the defeat at Norwich after he was late for a pre-match meeting. Koeman said if players thought misbehaving would make it easier to leave he would "put them in the stands until the end of their contract". He added: "In my opinion, that's not the way you have to do your job as a football player." Wanyama, who was sent off for two bookable offences in the 1-0 loss at Carrow Road, has 18 months left on his contract. 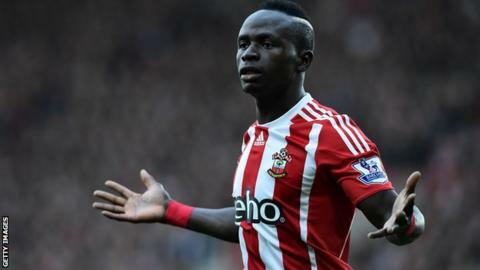 Mane, who has been linked with Manchester United, signed a four-year deal when he joined Saints in 2014. Asked about the pair's commitment to Southampton, Koeman said: "I'm not doubting about that. "It's too easy to mention after the mistake of Sadio, or the second yellow, that the players are showing that they like to move. "It's too easy, and it's not like that. The player knows the position in the club, and what we think about the players. "They are important players and they like to be here."